Black Adam begins his assault on Oolong Island and breaks through the sophisticated defenses that the scientists have developed. Dr. Cale has one last fling with Doctor Magnus before ranting about the fact that human history is at an end and that none of what is happening will be remembered. She leaves the complex and allows Black Adam to enter. The scientists make a final stand and manage to stun Black Adam and fit him with a Neuro Crown, which reroutes the electrical impulses that his brain sends his body. As Adam is brought to Sivana's lab T.O. Morrow feels triumphant when he wins the auction for the Red Tornado sculpture. Now all of the secrets of the cosmos are his. Steel, Natasha and Clark Kent watch as Lex Luthor is taken into custody. Kent suspects something is off about the situation and leads Steel and the authorities to a secret room in Luthor's building where the real Lex Luthor pretends to not know what is going on. Outside Natasha takes on and defeats Hannibal who had been impersonating Luthor. Green Lantern, Flash and Wildcat search the ruins of Bialya for any of its citizens who may have survived Black Adam's assault. Atom Smasher appears and asks to be part of the hunt for Black Adam. As a child Bruce Wayne watched in horror as his parents were gunned down in front of him. Making a solemn vow at their graveside Bruce trains his body and mind to the peak of human perfection. After taking to the streets as a vigilante Bruce realized he needed something to give him an edge. Something to scare the criminals he would face. Suddenly a bat flies through his study window, which Bruce takes as an omen. He fashions an outfit to strike fear into the hearts of his opponents and begins his crusade as Batman. Main Story - 5: Well, I didn't really see that coming. I mean I picked this book up, glanced at the cover, thought it was cool, started reading and expected that this would be another issue of Black Adam beating the living snot out of the DC Universe. I was happy with that too. There is a vicarious thrill in watching a character like Black Adam lay waste to an entire country because, well, I have a lot of anger in me and that kind of story is a release. Sure it started off that way. Black Adam was going through everything the mad scientists were throwing at him even when they would insist that there was no way he could do so. But this is Black Adam. He's pissed. He's beyond pissed. This man is all about some righteous anger and now that he has all of his power back he's one of the top ten most powerful beings on planet Earth. But then the writers threw in a monkey wrench. Black Adam got taken down. And I really liked it. As much as I like Black Adam and as much as I wanted to see the man to bring down the thunder with the fury of an angry god (or gods in this case) the ending to this particular day in 52 was great. If the writers had continued with Black Adam just mopping up everyone who had done him wrong eventually it would have gotten old. It's pretty basic creative writing; the protagonist (and I do see Black Adam as one of the protagonists of this series) needs to have conflict. Something has to happen to cause a complication, so I have no beef with his take down. Also, when you have that many big brains in one room odds are someone is going to come up with a device that will inflict harm on a super powered being. These guys may fail on an individual basis but there is no way that when they are amongst their peers and at the top of their game because everyone is throwing around ideas that they couldn't come up with something. Scientists are like writers; they may have massive egos and think highly of their skills, but throw them into a room together and just about any complication, fictional or not, will get solved. It may not always be a good idea, like splitting the atom or CIVIL WAR, but the task will be completed. So I liked that. I also liked the little bomb that Dr. Cale dropped about how the end times were coming and that soon none of what was going on would matter. I won't speculate on what that means because I think it's more fun to just let these things play out, but that was a great addition to the story. Also it was kind of amusing how she jumped Doc Magnus. Platinum would be kind of ticked but it was funny just the same. Speaking of funny I also dug T.O. Morrow's online auction sub-plot. The world is coming down around him and all he is concerned with is winning the Red Tornado armor. Then, right at the end, he comes in and throws one of the first successful "punches" at Black Adam. This was a definite highlight of the issue. The Lex Luthor portion of the issue played out exactly as it should have. That is Lex to me; scheming to the end and acting like he had done nothing wrong. It was a short chapter but it showed Steel, Clark Kent, Natasha, Lex and even Hannibal at their best. So with those two chapters and the JSA bit at the end which not only brought Atom Smasher back in the fold but foreshadowed the current Justice Society series (reviewed wonderfully by Neal Bailey at this site) this was a very satisfying issue. You can really feel that we're coming to an explosive conclusion and hopefully it will keep up that feeling until World War III finally hits. Art - 4: Olliffe and Geraci nailed the assault on Oolong Island with all of the giant robots, ray guns, tesseract technology and Neuro Crowns it entailed. The strength of the art though, and this is no disrespect to Olliffe and Geraci, is how Keith Giffen broke the story down into five and six panel pages to give the action and characterization the room they needed. If the layouts were huge splash pages featuring Black Adam throwing down with giant robots and such it would have looked good, but all of the little details that were put in because of the way the pages were framed would have been lost. Giffen is nothing if not a constant lesson that sometimes a tighter page layout works better than splash page after splash page followed by splash page. Back-Up Story - 5: I guess we're finally getting to the big three, which I really didn't expect. Mark Waid picked the theme of fear to hang his origin around and it worked. Batman has such a simple concept that it might seem easy to write his origin in two pages, but there are so many little details involving his training and why he chose a bat and everything that could muddle things. Waid ignored all of that and stuck with the core of the character, which made it a nice little read. 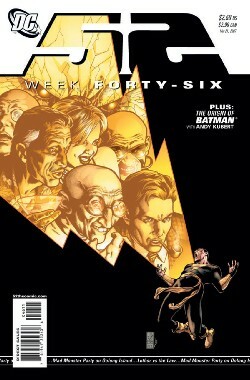 Back-Up Art - 4: Andy Kubert did an exceptional job of illustrating the key moments in Bruce Wayne's life. The death of his parents, the grave side vow, the training and the bat flying through the window were all done so well and had such an iconic feeling. It's interesting that there was only one really clear shot of Batman, but I think it worked better that way. I wonder if Adam Kubert is going to draw the Superman entry if they do one. Cover Art - 5: Another great cover. Not as cool as the Black Adam sitting on the throne image from a few issues ago, but I think this is a neat graphic representation of what happens in this issue. No complaints here.